Maraliner is a bus company owned by the government which is based in Kuala Lumpur, Malaysia. Maraliner express bus is part of the Maraliner Group, which consists of MARA liner Travel & Ads, MARA Liner Parts and MARA Liner Logistic. The company has been in the express bus industry for more than 30 years. Maraliner is widely known in offering various bus services throughout Peninsular Malaysia. 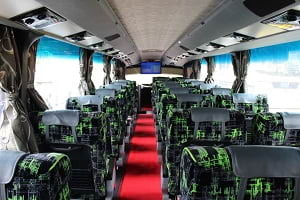 The popular bus routes offered by Maraliner include bus between Alor Setar and Shah Alam, Butterworth and Ipoh, Kuala Lumpur and Kedah and many more. 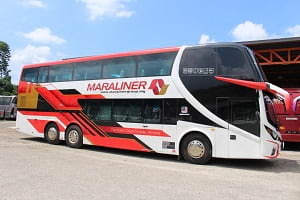 The type of bus deployed by Maraliner is a 26-seater Super VIP coach fully equipped with air-conditioner, spacious leg-room and reclining seats. With the vast experience and good service in terms of on-time departure, the company has been one of the first choice of travel for many Malaysian locals. By joining BusOnlineTicket.com, you can purchase Maraliner bus tickets online to skip the queue at the ticketing counter.